Tightly managing user accounts on cloud servers is critical. Manual provisioning or utilizing scripts to deploy users to cloud infrastructure creates security risks, unnecessary processes and reliability issues. Most admins know the right way to manage cloud server user accounts is to connect them to your directory. Unfortunately that is easier said than done. 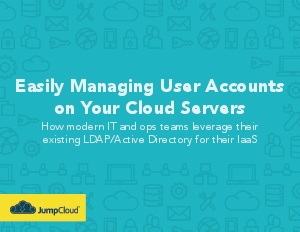 Download this new guide to learn how modern IT and ops teams can quickly and easily extend Active Directory or LDAP user stores to the cloud. This guide outlines how moving to a Directory-as-a-Service provides innovative organizations tighter security, reduced expenses, and increased agility. Don't let the shift to IaaS decrease your control and increase your security risk. Get the knowledge you need to keep up with this quickly changing landscape.